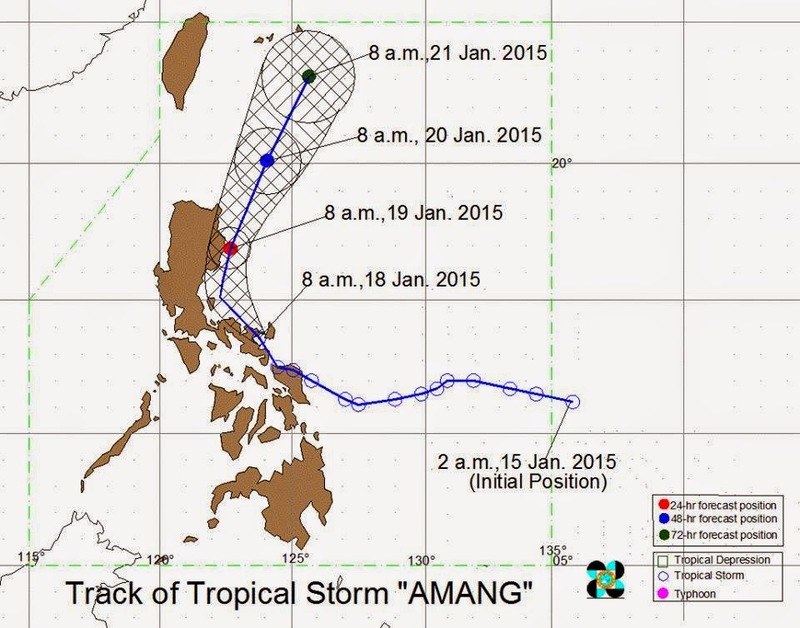 MANILA, Philippines - State weather bureau PAGASA on its 11:00am update today, January 18, 2015 said that 'Bagyong Amang' (Mekkhala) has slightly weakened after making landfall in Camarines Sur. At 10:00 AM today, the center of 'Bagyong Amang' was estimated based on all available data including Virac and Cebu Doppler Radars at 100 km West Northwest of Virac, Catanduanes Samar or at the vicinity of Camarines Sur (13.9°N, 123.4°E). 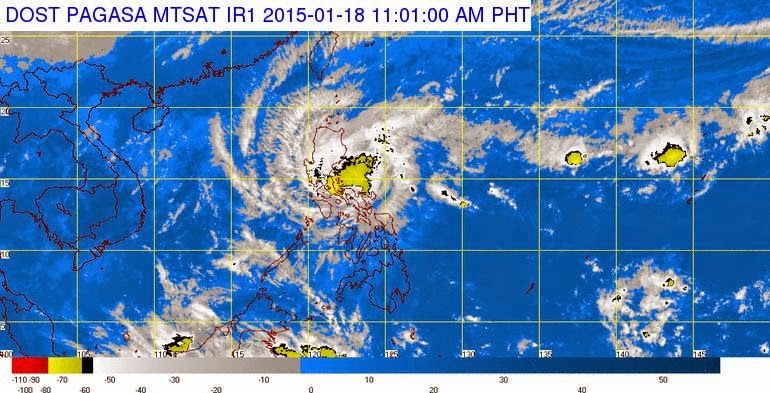 The tropical storm has a maximum sustained winds of 75 kph near the center and gustiness of up to 90 kph. It is forecast to move Northwest at 15 kph. Public Storm Warning Signal (PSWS) #2 (Winds of 61-100 kph is expected in at least 24 hrs): Catanduanes, Albay, Camarines Sur, Camarines Norte, Quezon incl. Polillo Island and Aurora. These areas will have stormy weather with heavy to intense rains. Residents along coastal areas are alerted against possible Storm surges. PSWS #1 (Winds of 30-60 kph is expected in at least 36 hrs): Metro Manila, Cavite, Laguna, Rizal, Batangas, Bulacan, Nueva Ecija, Nueva Vizcaya, Ifugao, Quirino, Isabela, Sorsogon, Masbate, Burias Island incl. Ticao Island, Marinduque, Northern Samar, Northern part of Eastern Samar and Northern part of Samar. The estimated rainfall amount is from 7.5 – 20 mm per hour (heavy - intense) within the 350 km diameter of the Tropical Storm. Residents in low lying and mountainous areas of the provinces with PSWS#2 and #1 are alerted against possible flashfloods and landslides. Ocean waves may reach up to 6.0 meters within the 350 km diameter of the storm. Fisherfolks and those with small seacrafts are advised not to venture out over the seaboards of Luzon, Visayas and the eastern seaboard of Mindanao.